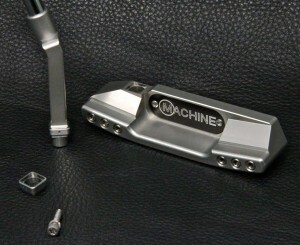 A MACHINE Delta Mod Adjuster shown assembled on a M1A putter (1 degree stronger loft shown). Fit – customers on the spot, off the rack to their specs for loft, lie and toe hang (in addition to existing weight, swing weight balance, shape and alignment options, etc). Adjust – players can adjust their specs to the conditions like never before. 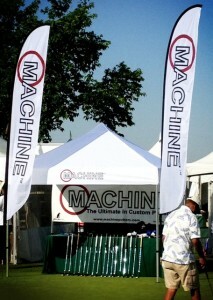 This is especially useful when playing faster or slower greens, while traveling for instance. Change – whenever you like, in as little as 20 seconds or less. In some respects the MACHINE Delta Mod Adjuster System is very similar to many adjustable Drivers, Fairway woods and some Hybrids in the market. 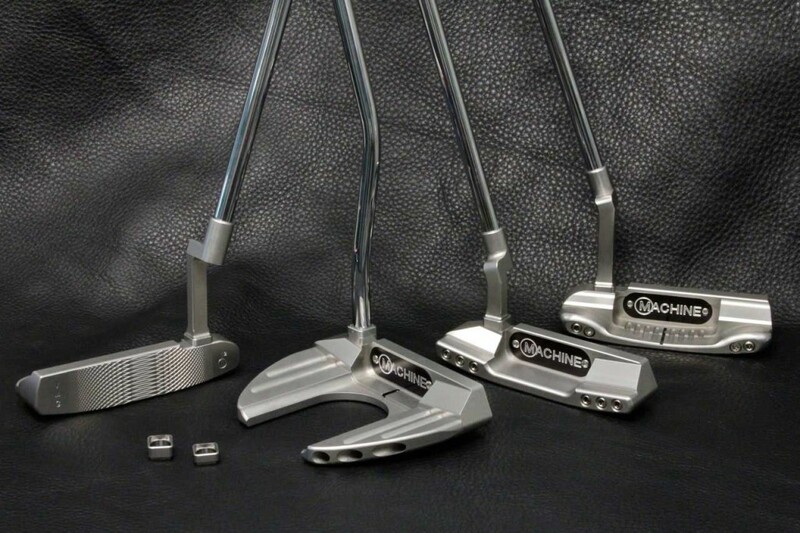 However, they offer even more unique benefits over full swing adjustability, and are truly an industry first for putters, especially as they can be utilized for traditional designs. These were designed to fit and work with all existing MACHINE Putters and hosels and can be ordered with new MACHINE Putters and as Accessories in Kits and Individually. 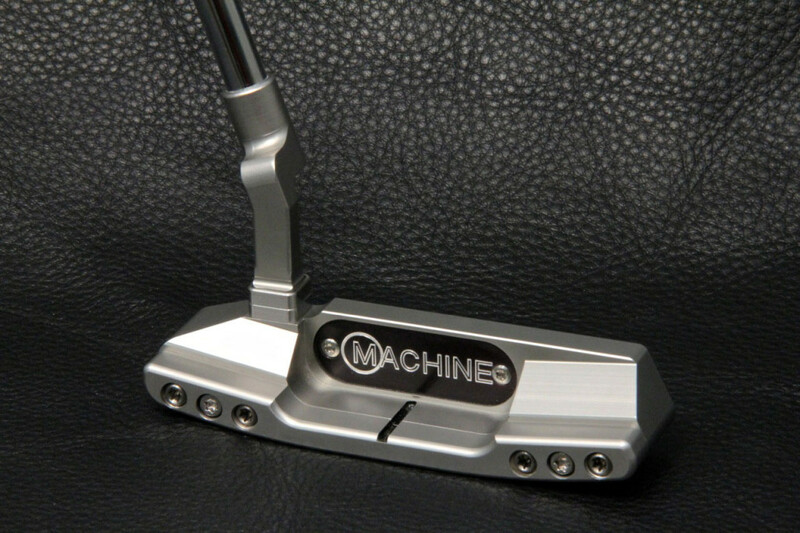 The Delta Mods are precision milled in-house in our HQ machine shop in Plano, so we can ensure the tightest tolerances, and the very best possible fit and finish. 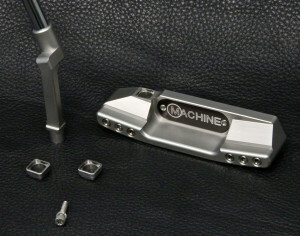 MACHINE Delta Mod Adjusters shown disassembled next to a M1A Adjuster head and pre-loaded Square Cut Plumber Neck. The Delta Mod Adjuster with one degree of change is shown assembled on the hosel stem prior to assembly into the head’s hosel port. The dimple mark designates 1 degree of change. Orienting towards the back of the putter as shown here makes the loft 1 degree stronger (from 3° standard to 2° in this setup). The Delta Mods Adjuster Hosel Modules (“Mods” for short) will be offered in different lengths, and different degrees of change. Different Mods can be used alone or stacked to change, allowing you to adjust loft and lie independent of one another, or in combination. Loft – Standard loft = 3 degrees standard – adjust down to 0 degree, ½˚, 1˚ or 2˚, and up to 4˚, 5˚ or 6˚ in ½ degree increments. Lie – 71 degrees standard – adjust flatter to 70 degrees, 69˚ or 68˚, and go more upright to 72˚, 73˚ or 74˚ in ½ degree increments..
Toe Hang – adjust from 1 to 10 degrees. If adjusting both loft and lie, you could go two (2) degrees in one direction, and one (1) in another also in ½ degree increments. For instance, you could go 2 degrees flat and 1 degree strong or weak or on the loft (2˚ or 4˚) or standard (3˚) if you used the standard / neutral ring. The Delta Adjuster Mods will be offered in standard (0 degree change), ½ degree, 1 degree and 2 degrees of change. Using two (2) rings stacked, one at 1 degree change and the other at 2 degrees, you could move as much as 3 degrees in any one direction (loft or lie). Moving the marked, tilted side of the Mod (marked with a hash mark for ½ degree, one dot for 1 degree, or two dots for two degrees) towards the heel makes the putter flatter, towards the toe makes it more upright. Moving the marked side towards the back makes the loft stronger, and moving it towards the face make the loft weaker. MACHINE Delta Mod Adjusters shown assembled on (left to right): M10, M2A Megalodon, M1A and M20 Beefy Back with custom shallow Bongo Ball Cuts. Two additional Delta Mods are shown in the foreground, one at 1/16” high (net) with 2 degrees of change, and the second at 1/8” high (net) with 1 degree of change.